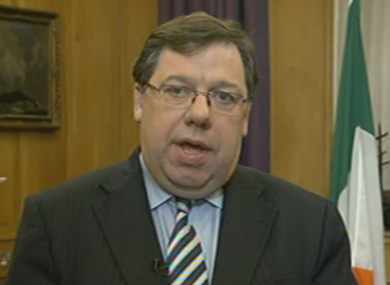 The Greens are uneasy about “additional revelations”, as Brian Cowen says “no discussions” took place with Seán FitzPatrick. THE GREEN PARTY has said it still has “concerns” about Brian Cowen’s meetings with Seán FitzPatrick, in light of “additional revelations” made by the Taoiseach in the Dáil yesterday. In a brief – but terse – statement issued this evening, the party said it remained concerned about the news that Cowen had also dined with Smurfit Kappa chief executive Gary McGann, a former director of Anglo, and Alan Grey of the Central Bank. Cowen insisted, however, that the topic of Anglo had not been discussed – and told RTÉ’s Six One news that “no discussions of any sort” had taken place between himself, FitzPatrick, McGann and Gray at the dinner following a round of golf at Druid’s Glen in July 2008. “I was sitting down with people, talking about the economy, how we could bring forward some job initiatives, [and] what we were going to do in terms of the slowdown of the economy,” Cowen said. The Greens’ statement also said that the party had held a meeting of its own parliamentary party following the Fianna Fáil meeting earlier today, when the party ‘noted’ Cowen’s move “to consult his parliamentary party members about the matter”. The statement was released just after Cowen’s Six One appearance, where the Taoiseach also said he had not considered resignation or “told anyone that I’m stepping down”. Instead, he maintained he had “spoken to my ministers at front bench level, and indeed some individually”, but said those discussions were strictly internal. There had been “no one who’s been not showing confidence in my leadership,” Cowen said. “I went to the parliamentary party meeting earlier today to make it quite clear that we have a sitting leader of the party; as Taoiseach of the country we have a job to do, we have to focus on that job, and I will resolve any issues that are being raised today quickly. “I’m making it clear that I’m the democratically-elected leader of the party,” the Taoiseach told Bryan Dobson. Cowen also asserted that he had not had any further dealings with Seán FitzPatrick “from facts within my own knowledge”. Backbench Fianna Fáil TD Seán Power later told Six One, however, that Cowen had been presented with a “dignified opportunity to do what was in the best interests of the party and the country” and resign, but had failed to take it. Email “Greens admit "concerns" about Cowen's Anglo dinner”. Feedback on “Greens admit "concerns" about Cowen's Anglo dinner”.